Spanish philosopher, physician, and polemic; born at Tudela in the middle of the fourteenth century; often confused with the physician Shem-Ṭob ben Isaac of Tortosa, who lived one hundred and fifty years later. While still a young man he was compelled to debate in public, on original sin and redemption, with Cardinal Pedro de Luna, afterward Pope Benedict XIII. This disputation took place in Pamplona, Dec. 26, 1375, in the presence of bishops and learned theologians (see his "Eben Boḥan"; an extract, entitled "Wikkuaḥ" in manuscript, is in the Bibliothèque Nationale, Paris, No. 831). A devastating war which raged in Navarre between the Castilians and the English obliged Ibn Shaprut, with many others, to leave the country. He settled at Tarazona, in Aragon, where he practised his profession of physician among both Jews and Christians. As a Talmudic scholar he carried on a correspondence with Sheshet. At Tarazona he completed his "Eben Boḥan" (May, 1380 or 1385), a polemical work against baptized Jews. As a model and guide for this work, which consists of fourteen chapters, or "gates," and is written in the form of a dialogue, he took the polemical "Milḥamot Adonai" of Jacob ben Reuben, falsely attributed to David Ḳimḥi. Ibn Shaprut's work, however, is not a partial re production of the "Milḥamot," as has been incorrectly stated ("Oẓar Neḥmad," ii. 32); it is rather an extension or continuation of it, since it goes into, details which are either not mentioned, or are mentioned only briefly, in the other. In the fifteenthchapter, which Ibn Shaprut added later, he criticizes a work written by Alfonso do Valladolid against Jacob ben Reuben. The thirteenth chapter contains a very interesting fragment by a fourteenth-century Schopenhauer, who wrote under the pseudonym "Lamas" ("Samael"). The "Eben Boḥan" has been preserved in several manuscripts. In order to assist the Jews in their polemical writings, Ibn Shaprut translated portions of the Four Gospels into Hebrew, accompanying them with pointed observations; answers to the latter, written by a neophyte named Jona, also exist in manuscript. Ibn Shaprut wrote a commentary to the first book of Avicenna's canon entitled '"En Kol," for which he probably made use of the Hebrew translation of Sulaiman ibn Yaish and that of Allorqui, which latter he criticizes severely. 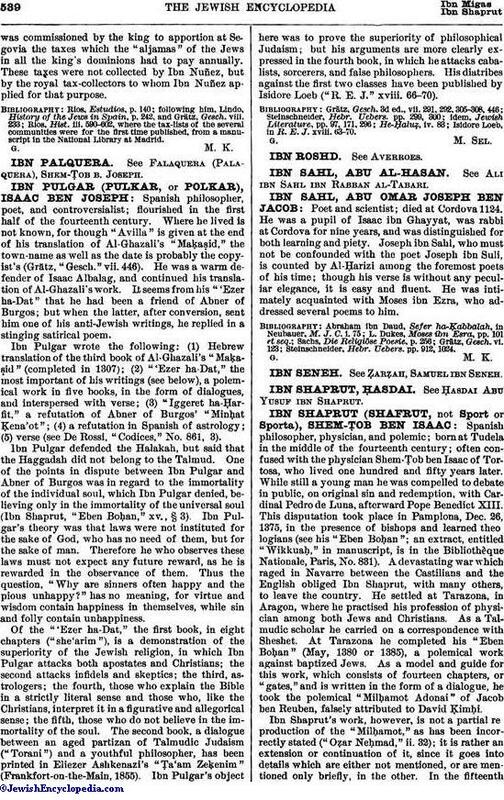 He also wrote a supercommentary, entitled "Ẓafnat Pa'aneaḥ," to Ibn Ezra's commentary on the Pentateuch (see M. Friedländer in the "Publications of the Society of Hebrew Literature," series ii., vol. 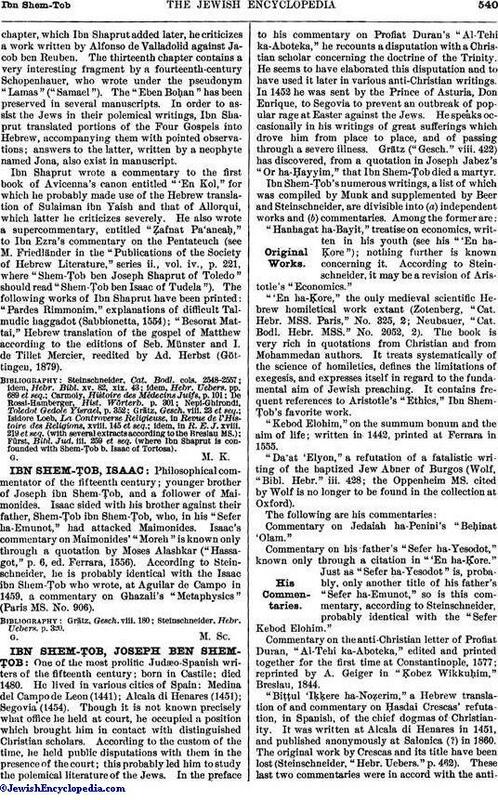 iv., p. 221, where " Shem-Ṭob ben Joseph Shaprut of Toledo" should read "Shem-Ṭob ben Isaac of Tudela"). The following works of Ibn Shaprut have been printed: "Pardes Rimmonim," explanations of difficult Talmudic haggadot (Sabbionetta, 1554); "Besorat Mattai," Hebrew translation of the gospel of Matthew according to the editions of Seb. Münster and I. de Tillet Mercier, reedited by Ad. Herbst (Göttingen, 1879). Fürst, Bibl. Jud. iii. 259 et seq. (where Ibn Shaprut is confounded with Shem-Ṭob b. Isaac of Tortosa).